Grow a pineapple from a top every time with these easy to follow instructions. Choose a mature pineapple that has healthy, firm, green leaves (not yellow or brown) and with a fruit skin that is golden brown (not too green). Test for ripeness by gently pulling on a leaf. If it pops out with ease, the fruit is overripe. Do not cut the top of this pant. The biggest mistake people make is cutting the top. There is root buds in the under some of the leaves of the pineapple. 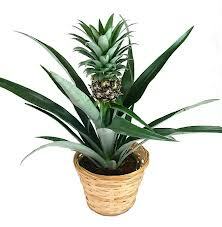 If you cut the top you may be cutting the root buds off and the pineapple will not take root. Instead grab a hold of the entire top of the pineapple and twist the top off. This will leave the root buds in tact. Next, strip off some of the lower leaves, exposing 1inch to 1- 1/2 inches of the base of the crown. The leaves will come off in a sort of spiral fashion. The idea is to bare the stalk and open up the root buds. The brown colored bumps below the leaf scars are root primordial (baby roots waiting to grow) and there may even be a few short roots at the base of the crown. Try to not damage these. Put the crown in a glass of water until the roots start growing out. Change the water every few days. Keep it away from temperature extremes. The leaves on the pineapple top may look likt they are dying this is ok, almost all the leaves will dye off before a new plant take s root. Once you see a nice amount of roots coming in and new growth on the plant then it is time to put it in a pot. Plant the crown in an 6-inch (15.2 cm) pot using light garden soil with a 30% blend of organic matter. Press the soil firmly around the base of the crown without getting any soil on the leaves. Keep the plant moist (but not wet) in a sunny, warm and humid place where the night temperatures won't drop below 65ºF (18ºC). If conditions are dry, mist the plant regularly. Water the soil lightly once a week. Fertilize the plant with half-strength fertilizer twice a month during the summer. Look for flowers. It can take approximately 2 - 3 years, but eventually a red cone should appear from the center of the leaves followed by blue flowers and eventually a fruit. It takes about six months for the fruit to fully develop. 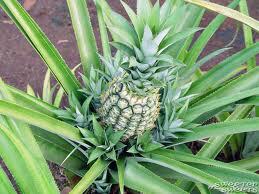 The pineapple will grow from the flower, above ground, in the center of the plant.